– 120 videos sourced from YouTube. When you use the software, it fetches the latest selection of most popular videos for this particular niche. So when you build your site, you can be sure it will be fully up to date with the very latest videos. – Optional Adsense ad units, featuring your Adsense ID, on each video page. – Optional custom text ad units (instead of Adsense ad units) on each video page. You can advertise anything you want (such as affiliate links). The custom text ads are entered just by editing a simple text file. – A large Amazon ad unit, featuring your Amazon ID, on each video page. – Video site search box, allowing your visitors to search video titles for a particular word. 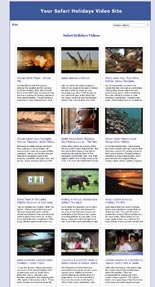 – Professional looking home pages, featuring thumbnails of each video. – Header graphic automatically customized with your chosen text. – Site consists of ordinary HTML pages that can be edited with any HTML editor.